We all have moles, somewhere on our bodies. They can be found anywhere from our scalp to the soles of our feet. Unfortunately, some moles can be the bearer of bad news, like being a sign of melanoma. Every year, more and more people of all races die from melanoma, the deadliest form of skin cancer. Fortunately, knowing a bit about the moles and their characteristics can be the catalyst to swift action that can save lives. I’m referring to the ABCDE of skin cancer. A is for SYMMETRY – If you draw a line through the mole, both sides should be equal. If one-half of the mole does not match the other half that’s bad. B is for BORDER – If the outer edges are uneven, jagged, notched, or blurred that’s bad. 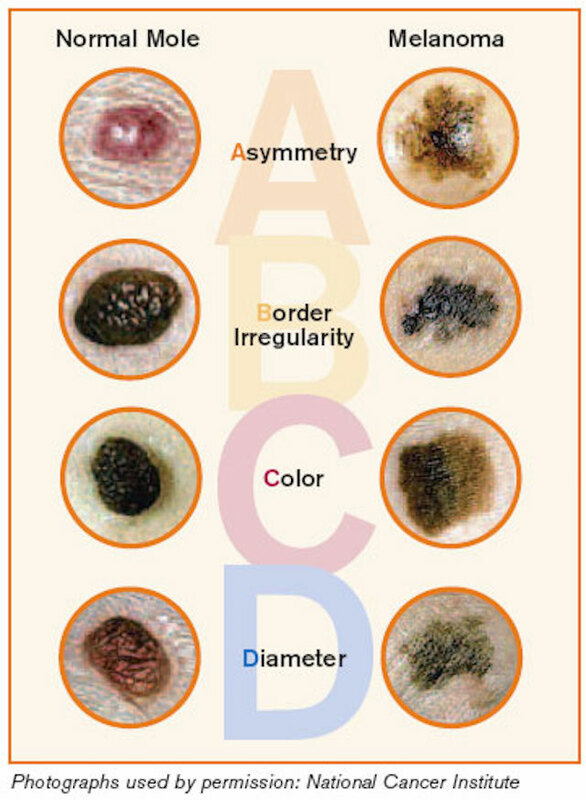 C is for COLOR – the color should be consistent throughout the mole. If it’s dark black or have multiple colors that’s bad. If it is tan or one uniform color that’s good. D is for DIAMETER – the diameter should not be greater then 1/4 inch (6 mm) or should not be growing larger. If it’s smaller than a pencil eraser that’s good. If it’s larger that’s bad. E is for Evolution – This refers to the changes the mole goes through over time. Paying attention to and noting these changes are important. Be sure to share with your physician any changes you notice over time.